The masterpiece of the Lord God’s loving plan for the Eucharist and the salvation of His Children was intricately woven long before we finally saw the big picture. And even then more is revealed each time we dwell and contemplate on the mystery. Through His loving sacrifice of Himself for us, we are restored, renewed and fully alive to love and serve with joy. To love and serve not only the living God but the least of our brethren. All our loving words and actions must be accompanied by sacrifice. For it is only through sacrifice that they are purified. The world who does not yet know our Lord Jesus Christ will think us mad and may even rebuke or insult us for spending so much time and effort in the service of Him and brethren. The Lord says to us “Blessed are you when people insult you, persecute you and falsely say all kinds of evil against you because of me. Rejoice and be glad, because great is your reward in heaven, for in the same way they persecuted the prophets who were before you. 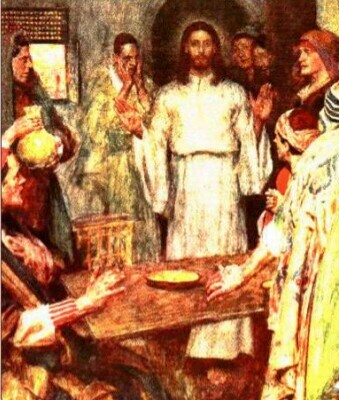 There was a tent which comprised two compartments: the first, in which the lamp stand, the table and the presentation loaves were kept, was called the Holy Place; then beyond the second veil, an innermost part which was called the Holy of Holies. But now Christ has come, as the high priest of all the blessings which were to come. He has passed through the greater, the more perfect tent, which is better than the one made by men’s hands because it is not of this created order; and he has entered the sanctuary once and for all, taking with him not the blood of goats and bull calves, but his own blood, having won an eternal redemption for us. The blood of goats and bulls and the ashes of a heifer are sprinkled on those who have incurred defilement and they restore the holiness of their outward lives; how much more effectively the blood of Christ, who offered himself as the perfect sacrifice to God through the eternal Spirit, can purify our inner self from dead actions so that we do our service to the living God.